Happy New Year! And welcome to our weekly blog posts to celebrate women’s accomplishments in Dayton, Ohio! As we gear up towards our next publication, Empowered Women of Dayton, we hope you will help support our efforts to put history into the hands of children in our community. If you like our posts and want to know more, please check out our full webpage to learn more about who we are and what we do! Today’s post is all about Annie McCully, Dayton’s first policewoman. She was also a member of the suffrage association and advocated not just for women’s right to vote, but also teaching women about the issues and important things to know on the ballot. Enjoy! Annie Rebecca McCully was born in Crestline, Ohio on March 15, 1873 to progressive-minded parents Marion and Frances McCully. Her childhood was spent in Sandusky and Newark, but later her family moved to Dayton, Ohio where she lived the majority of her life. In Dayton, she was a school teacher, advocating for kindergarten programs with the support and financial help of the famous business leader John H Patterson. She was also Dayton’s first policewoman, from 1914-1918. She was a charter member of the Second Church of Christ Scientist, and she was an active Christian Scientist. McCully never married, though census records indicate she lived with a partner, Effie M Hecker. She died in Columbus, Ohio on April 17, 1960 and her body was cremated and placed in her family’s crypt in Los Angeles, California. Annie McCully was a leader in the campaign for women’s suffrage in Ohio, both locally and state wide. Her obituary in the Dayton Daily News indicated she had received advice and a $500 check from John H Patterson “to be used in the suffrage fight.” Her leadership is largely documented from 1919-1922. Letters to the Dayton Suffrage Association indicate that she was not only a member, but also a part of the enrollment and finance committees of that organization. In these letters, written by Ohio Suffrage Association President, Harriet Taylor Upton, McCully is named numerous times as she and other members travelled across the state campaigning for memberships. 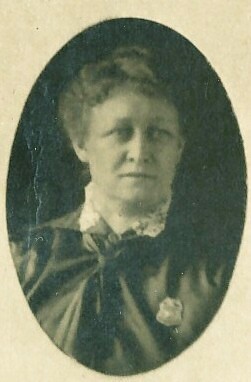 After Suffrage was passed in 1920, McCully was active in the transition from the Ohio Suffrage Association to the Ohio League of Women Voters. In Dayton, she and Minnie Stanley, President of the League of Women Voters Dayton Area Chapter, organized and led a School of Citizenship as the first work of the League. Their goal was to educate women about political issues and basic citizenship duties and rights now that they had the right to vote. McCully maintained an active role within the Dayton League of Women Voters through the early part of the 1920s. The initial meetings of the League had tremendous representation from all of the Women’s Clubs in Dayton at the time. At these early meetings, the governing records and body for the organization were discussed and decided upon, with McCully making many of the suggestions. In March 1922, McCully was a key member of the membership committee. In this year, the impact of the League in Dayton was evident. At the May 16, 1922 meeting, reports indicated that 220 newspaper stories on the Local League work had been written, indicating an average of 3 per week since January 1921. Annie McCully contributed significantly to the success of this organization, and in educating women to become well-informed participants in government. Annie McCully passed away on April 17, 1960 in Columbus, Ohio.